I scored this belt last summer for several bucks. Lately I've been seeing the style popping up on various websites, making me feel slightly cool. I love leather work and colors of the belt, not to mention how nicely it fits around my waist! Can I please get a round of applause for my darling friend Chelsea? You may see her popping up time to time in my pictures as my dashing model! I paired it with a simple white tunic and sandals, how would you style this thrifted find? I love it! I would pair it with everything I own! I currently have a similar belt in darker colors that used to be my Mom's. It is one of my favorite things in the whole world. 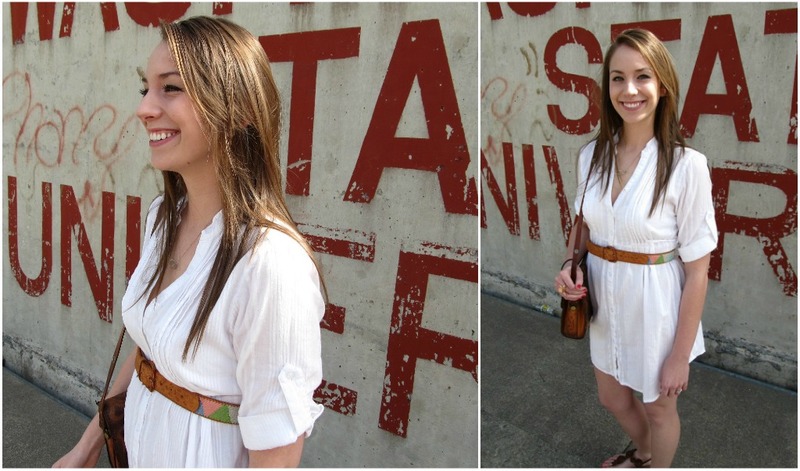 There really is nothing better than a belt you love, seriously! Thank you! I will let her know you said that :-) I have been obbsessing iver getting aqua colored jeans for awhile now!! Where did you get yours? And if the time ever comes when I think the belt and I should part ways I'll pass it on to you haha. I agree! My mom has so many cool belts that I try to steal from time to time!